Despite all attempts to depoliticize Washington State’s redistricting process by taking it out of the hands of the legislature, it appears that political infighting may again be getting in the way of a speedy drawing of new voting lines. Only this time it is not the usual red and blue shirts holding up progress, but an internal rift among Democrats over whether a new majority-minority congressional district in South Seattle should take priority over the creation of a cozy district dominated by state workers in Thurston County. Win/Win, OneAmerica and allies in the progressive wing of Washington’s Democratic Party are at loggerheads with an organized faction of their party’s establishment who view situating a majority-minority district in the South Seattle as an impediment to creating a new district around the state capital of Olympia, one that currently exists only on the drafting tables of Democrat strategists as the means for getting Denny Heck elected to Congress. As the Heck coalition works through one Democrat-appointed commissioner and the South Seattle 10th effort works through another, they each run the risk of losing sight of the purpose of the hearings. In between the lines, the implication of voting rights activists that minority communities in Washington’s Democrat-controlled environment remain dissatisfied with their representation and unwelcome in the political process may be cause for soul-searching within the party of progressives. In a real sense, the cold war developing between establishment Democrats and progressives over the preferred location of the 10th District has the danger of dragging the Redistricting Commission down into a political quagmire. Failing to meet a self-imposed November 1st deadline to present a map to the public has begun to look more and more likely. The proposal to situate the 10th District in South Seattle has been spearheaded by the national immigrant activist group OneAmerica, working in close coordination with the Win/Win Network, a Washington state collaborative of progressive interest groups. At the Redistricting Commission’s hearing in Auburn on May 23rd, OneAmerica submitted their proposed map for a new 10th Congressional District to be considered, a swatch of territory that would take large chunks out of the 7th and 9th Congressional Districts, and would nip at the edges of the present-day 8th. One day earlier, another OneAmerica volunteer had stepped to the microphone in Pasco to deliver the same message, as well as adding his voice to the ACLU and other voting rights groups calling for the creation of a majority-minority legislative district from dominantly Hispanic neighborhoods in Yakima. The case for a Hispanic voting district in Yakima was further underscored in remarks to the Commission from Seattle University professor and voting right advocate Joaquin Avila. “From [the Hispanic] community perspective, what is right is that the legislature should be reflective of the people that it represents, the legislature must be diverse,” Avila said. Guevin, Cheung, and Avila are speaking for different communities but expressing the same concern. In the Democrat-controlled political environment of Washington, minorities do not receive adequate representation and are not encouraged to participate in the political process. 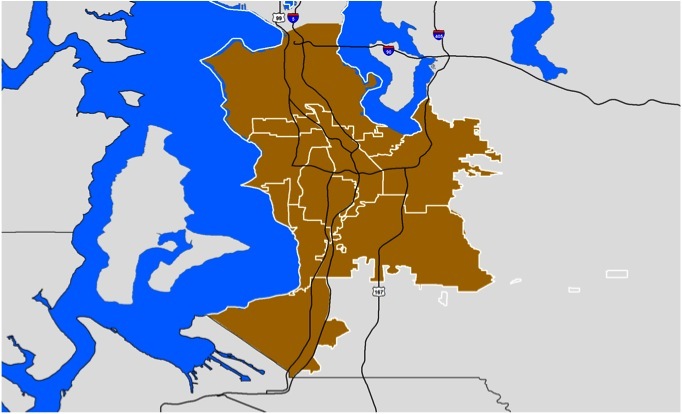 Because the desired location for the South Seattle 10th District is found squarely inside of Democratic territory that is as solid as it gets in politics, it begs the question: If Congressmen Jim McDermott and Adam Smith are not representing the minorities in their districts, might it be a failure of the policies, not the politicians? Another frustrating feature of the 10th District debate among Democrats may be what a South Seattle congressional district does in terms of redistricting math. The 2010 Census showed clearly that the Seattle metropolitan area is shrinking and because districts are created based on population – not area – each of Seattle’s congressional districts technically should be expanding in size. But wedging a new district into the area compounds the problem, creating a spill-over effect around the state and creating potential advantages for Republicans. Using an online tool loaded with the most up-to-date census and voting data, NW Daily Marker took a stab at performing a redistricting of Washington State. We used the OneAmerica 10th District map as our base, and attempted to follow the laws and guidelines imposed on the Redistricting Commission – in brief, a) districts should be contiguous, b) they should follow municipal and county boundaries as much as is practicable, and c) they must distribute the state’s population equally among all counties, with a small tolerance. Our wholly unscientific experiment in redistricting created an interesting result when compared with the current district map (image to right, click to view larger). There are certainly different maps that could emerge from this quasi-arcane process. But no map can disregard facts about where Washington’s population is growing. The Commission was reminded about these stark realities by a citizen at the Pasco hearing. “It’s either lose a district now or two later,” Wyss warned. I heard several commentors say the same thing at the Everett meeting. They want the district based on “diversity”. Where does race even come in? Shouldn’t it be based on population, not the color of the people? Didn’t make sense to me.